Neuburger P, Potosky R, Ursomanno P, Abdallah R, Saric M, Benenstein RJ; Staniloae CS; Slater J, Querijero M, Williams M. Implementation of a moderate sedation protocol for transfemoral transcatheter aortic valve replacement: A review at 6 months. J Am Coll Cardiol. 2015;66(15_S):B258-B258 (# 1841642) [Meeting Abstract]. Presented at the TCT 2015 meeting in San Francisco, October 11-13, 2015. Castillo Kontak L, Saric M. An unusual case of Shone’s complex visualized by three dimensional transesophageal echocardiography. Abstract presented at the New York University Department of Medicine Annual Research Day on Tuesday, May 7, 2013. Quiñones A, Benenstein R, Saric, M. New-onset seizure after perflutren microbubble injection during dobutamine stress echocardiography. Abstract presented at the New York University Department of Medicine Annual Research Day on Tuesday, May 7, 2013. Mecklai A, Rosenzweig B; Applebaum R, Benenstein R, Axel L, Grossi E, Chan A, Saric M. An unusual cause of a headache: acquired aortic coarctation due to intimal sarcoma masquerading as a meningioma. Abstract presented at the New York University Department of Medicine Annual Research Day on Tuesday, May 7, 2013. Hastings RS, Okoro C, Koon P, Iqbal S, Katz S, Saric M. A case of severe cryptogenic intermittent mitral regurgitation leading to cardiogenic shock. Abstract presented at the 2013 American College of Cardiology Scientific Sessions, March 9-11, 2013 in San Francisco, CA. Saba SG, Chung S, Tseng S, Bhagavatula S, Donnino R, Srichai MB, Saric M, Katz S, Axel L. Cardiac MRI correlates of diastolic left ventricular function assessment by echocardiography. Abstract presented at ISMRM/SCMR 16th Annual Scientific Sessions meeting, February 1-4, 2013 in San Francisco, CA; published in Journal of Cardiovascular Magnetic Resonance 2013;15(Suppl 1):E53 (30 January 2013). Patel RD, Lim RP, Saric M, Nayar A, Babb J, Axel L, Lobach I, Srichai MB. Diagnostic performance of CMR and transthoracic echocardiography in clinical evaluation of cardiac masses with histopathological correlation. Abstract presented at ISMRM/SCMR 16th Annual Scientific Sessions meeting, February 1-4, 2013 in San Francisco, CA; published in Journal of Cardiovascular Magnetic Resonance 2013;15(Suppl 1):P59 (30 January 2013). Kataoka A, Scherrer-Crosbie M, Saric M and other ISCHEMIA Trial investigators, Picard MH. Transient ischemic dilatation during stress echocardiography: A marker of significant myocardial ischemia. Abstract submitted for the American Heart Association Annual Scientific Sessions, November 16-19, 2013 in Dallas, TX. Chyou, JY; Roswell, RO; Argilla, M; Saric, M; Mosca, R; Katz, SD; Rosenzweig, BP. Blue again: Recurrent cyanosis in a 30-year-old man with surgically palliated cyanotic congenital heart disease. Circulation. 2012 126(21):A526 (# 2793532) [Meeting Abstract]. This abstract was presented at Laennec Young Clinician Session, American Heart Association Scientific Sessions. November 3-7, 2012. Los Angeles, CA. Purgess, J.R. Bernstein, S., Saric, M. Real-time 3D transesophageal echocardiography: development of a protocol for use in atrial fibrillation ablation procedures. Presented at the 34th Annual Meeting of the Society of Cardiovascular Anesthesiologists held April 28-May 2, 2012 in Boston, MA. Abstract number SCA59; published in Anesth Analg 2012;114(suppl);1-94. Tatyana A. Danilov, MD; Muhamed Saric, MD, PhD; Gila Perk, MD; Itzhak Kronzon, MD. Simplified method for proper orientation of 3D transesophageal images of atrial septal defects: The TUPLE maneuver. This abstract was the winner of the 11th Annual Joan Barber Memorial Research Award given by the New York Echo Society in June 2010. Rahul R. Jhaveri MD; Muhamed Saric MD, PhD; Itzhak Kronzon MD. Uncommon Doppler echocardiographic findings of severe pulmonic insufficiency. This abstract was the winner of the 11th Annual Joan Barber Memorial Research Award given by the New York Echo Society in June 2010. Alana Choy-Shan, MD; Muhamed Saric, MD, PhD; Gila Perk, MD; Itzhak Kronzon, MD. Standardized protocol for anatomically correct orientation of 3D transesophageal images of the thoracic aorta. This abstract was the winner of the 11th Annual Joan Barber Memorial Research Award given by the New York Echo Society in June 2010. Frankel Z, Saric M, Kronzon I, Varkey M, Perk G. Real-time, three-dimensional transesophageal echocardiography in the evaluation of thoracic aortic atherosclerosis. Poster presentation at American Heart Association Scientific Sessions, November 17, 2009, Orlando, FL. Bhatti W., Maldjian P.D., Saric M. Partial anomalous pulmonary venous connection in adults: Evaluation with MDCT. Presented at the 2nd World Congress in Thoracic Imaging and Diagnosis in Chest Disease, May 30 - 2 June 2, 2009 in Valencia, Spain. Maldjian P.D., Saric M., Lee E., Mitchell J. Important cardiac findings on non-ECG-gated multidetector CT scans performed to detect pulmonary embolism with echocardiographic correlation. Presented as Electronic Educational Exhibit for 2008 meeting of the Radiologic Society of North America (RSNA), Dec 1-5, 2008, Chicago, IL. Note: The RSNA meeting is the largest and most competitive yearly radiology meeting. Parameshwari B, Maldjian PD, Saric M, Lee E, Mitchell J. Important cardiac findings on non-ECG-gated multidetector CT scans performed to detect pulmonary embolism with echocardiographic correlation. 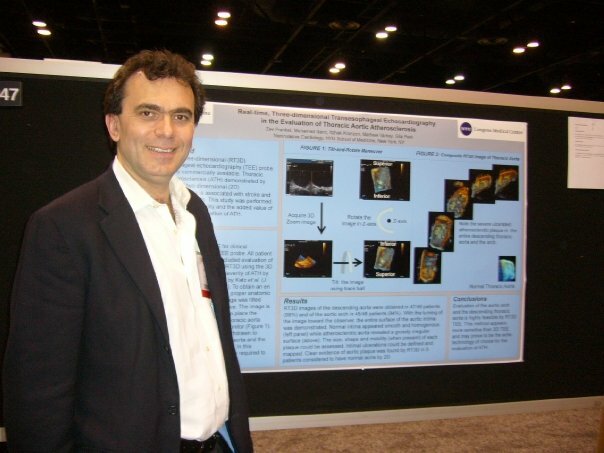 Poster presentation at the Annual Meeting of the Society of Thoracic Radiology, March 2-5, 2008, Fort Meyers, FL. Patel, R.J., Zakir, R.M., Sethi, V., Patel, J.N., Apovian, J., Alexander, J.C., Klapholz, M., Saric, M. Unrepaired tetralogy of Fallot with right hemitruncus in an adult: A rare case. Poster presentation at the 14th World Congress of Heart Disease on Sunday, July 27, 2008 at 14:00-18:00 in Poster Hall at The Fairmont Royal York, Toronto, ON, Canada. Anis, A., Leticia, D., Dhruva, V.N., Saric, M., Klapholz, M. Novel use of myocardial contrast echocardiography in critically ill patients with non-cardiac diagnoses and mild to moderate troponin elevation (ECHO-IN-ILL Trial). Presented at the EuroEcho Congress, December 5-8, 2007 in Lisbon, Portugal. Zakir, R., Patel, R., Abro, Z., Anis, A., Saric, M., Klapholz, M. Hypertension in African-Americans with heart failure: Progression from hypertrophy to dilatation; perhaps not. Presented at the 11th Annual Scientific Meeting of the Heart Failure Society of America, September 16-19, 2007 in Washington, DC. Anis, A., Patel, B., Williamson, M., Dhruva, V.N., Ahuja, S., Levine, J., Saric, M., Klapholz, M. Incidence of obstructive coronary artery disease in intensive care unit patients admitted with cardiac and noncardiac diagnoses with modest troponin elevation. Presented at the 72nd Annual International Scientific Assembly of the American College of Chest Physicians, October 25, 2006 in Salt Lake City, UT. Abstract published in Chest 2006;130(4):198S. Anis, A., Saric, M., Haider, B., Cohen, Z.I., Klapholz, M. Lupus myocarditis treated with intravenous immunoglobulin under hemodynamic monitoring. Oral presentation at the 72nd Annual International Scientific Assembly of the American College of Chest Physicians, October 23, 2006 in Salt Lake City, UT. Published in Chest 2006;130(4):292S. Anis, A., Patel, B., Williamson, M., Dhruva, V.N., Ahuja, S., Levine, J., Saric, M., Klapholz, M. Incidence of obstructive coronary artery disease in intensive care unit patients admitted with cardiac and noncardiac diagnoses with modest troponin elevation. Presented at the 72nd Annual International Scientific Assembly of the American College of Chest Physicians, October 25, 2006 in Salt Lake City, UT. Published in Chest 2006;130(4):198S. Anis, A., Rafiq, A., Abdelhadi, S., Maldjian, P.D., Manela, D., Zakir, R., Saric, M., Klapholz, M. Correlation between chest radiograph and serum brain natriuretic peptide levels in patients presenting with dyspnea. Presented at the 72nd Annual International Scientific Assembly of the American College of Chest Physicians, October 25, 2006 in Salt Lake City, UT. Published in Chest 2006;130(4):195S-196S. Zakir, R. M., Patel, R. J., Ahuja, S., Saric, M., Klapholz, M. Increases in left ventricular mass is more pronounced in low ejection fraction versus normal ejection heart failure. Presented at the 10th Annual Scientific Meeting of the Heart Failure Society of America, September 10-13, 2006 in Seattle, WA. Folefack, A., Zakir, R. M., Saric, M., Berkowitz, R. L. Midodrine increases blood pressure in hypotensive heart failure patients facilitating optimization of heart failure therapy leading to improved outcomes. Presented at the 10th Annual Scientific Meeting of the Heart Failure Society of America, September 10-13, 2006 in Seattle, WA. Zakir, R. M., Patel, R., Saric, M., Berkowiz, L. R. Nesiritide is effective for patients with diastolic dysfunction with and without associated right ventricular failure and significantly improves renal function. Presented at the 9th Annual Scientific Meeting of the Heart Failure Society of America, September 18-21, 2005 in Boca Raton, FL. Budhwani, N., Patel, S., Bejjanki, R., Blaivas, A., Dwyer, E. M., Saric, M. The impact of gender and age on left ventricular hypertrophy-related electrocardiographic abnormalities in patients with increased left ventricular mass. Poster presented at the 19th Annual Scientific Meeting American Society of Hypertension, New York, NY, May 18-22, 2004. Zakir, R. M., Gasser, M., Najam, N., Khan, M., Saeed, A., Saric, M., Yao, S., Sherrid, M., Chaudhry, F. A. Feasibility and reproducibility of coronary blood flow assessment during dobutamine stress echocardiography. Poster abstract presented at the 14th Annual Scientific Sessions of the American Society of Echocardiography, Las Vegas, NE, June 11-14, 2003. Stoupakis, G., Orlando, J., Kalia, H., Skurnick, J., Saric, M., Arora, R.R. Preservation of myocardial microcirculation during mechanical reperfusion for myocardial ischemia with either abciximab or eptifibatide. Presented at the 18th Annual Interventional Cardiology, Snowmass Village, CO, March 3-7, 2003. Fuhrman, M., Lewis, W., Saric, M., Sterling M. Achalasia: An unusual cause of congestive heart failure. Presented at the 67th Annual Scientific Meeting of the American College of Gastroenterology, Seattle, WA, October 18-23, 2002. Arora, R., Carlucci, M., Lopez, S., Malone, A., Shah, H., Richard, M., Bejjanki, R., Smith, T., Belizaire, C., Saric, M. Enhanced external counterpulsation (EECP) improves systolic function in patients with coronary artery disease (CAD). Presented at the Canadian Cardiovascular Congress 2002, October 26-30, 2002 in Edmonton, Alberta. Kort, S., Saric, M., Applebaum R. M., Phoon, C.K., Goldstein, S.A., Tunick, P.A., and Kronzon, I. Pulmonary venous flow in large atrial septal defects: A new Doppler pattern. Presented at the 47th Annual Scientific Sessions of the Israel Heart Society, Tel Aviv, April 2000. Saric, M., Applebaum R. M., Phoon, C.K., Goldstein, S.A., Tunick, P.A., and Kronzon, I. Pulmonary venous flow in large uncomplicated atrial septal defect. Abstract presented at the 72nd Annual Scientific Sessions of the American Heart Association, Atlanta, GA, November 7-10, 1999 & published in Circulation 1999;100(18):I-213; abstract #1101. 1. Saric, M., Clarkson, A.B., Jr. Detection of ornithine decarboxylase activity in rat Pneumocystis carinii lysates. Presented at the Keystone Symposia on Molecular and Cellular Biology: Molecular and cellular biology of host-parasite interactions. January 15-20, 1992; published in J Cell Biochem Suppl 1992;16A:167. 2. Saric, M., Bienen, E.J., Pollakis, G., Grady, R.W., and Clarkson, A.B., Jr. Mitochondrial proton motive force in bloodstream forms of African trypanosomes demonstrated by rhodamine 123. Presented at the 38th Annual Meeting of the American Society for Tropical Medicine and Hygiene, Honolulu, Hawaii, December 10-14, 1989. 3. Clarkson, A.B., Jr., Bienen, E.J, Saric, M., McIntosh, L., Grady, R.W., Trypanosome alternative oxidase. Proceedings of the Workshop on Chemotherapy for trypanosomes held at ILRAD, Nairobi, Kenya, August 21-24, 1989. Saric, M., Rodwin, G.V. (1989) Health care strategy for Morocco. Presented at the 117th Annual Meeting of the American Public Health Association, Chicago, October 22-26, 1989.